Their first official parade was on November 7, 1957 at the Shrine ceremonial which was held in Dunn that year. The clowns were welcomed with open arms. Curtis Ennis stated, "We created quite a fuss in the neighborhood. Actually, we never dreamed the reception would be so good." Next, was the Dunn Christmas parade on December 7th where they were a hit! It was on from there. 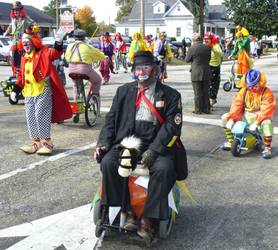 They traveled all over the Southeastern United Sates to clown in ceremonial parades in places like New Orleans, Jacksonville Fl., Birmingham, Atlanta, etc. The train would stop in Dunn to pick up the unit and their old truck and off they went to the next adventure. Early on the unit had no music so they prearranged with high school bands to dance and perform behind the bands as they marched in parades. After realizing they needed to make their own noise, the first sound system they had was a child's wagon. 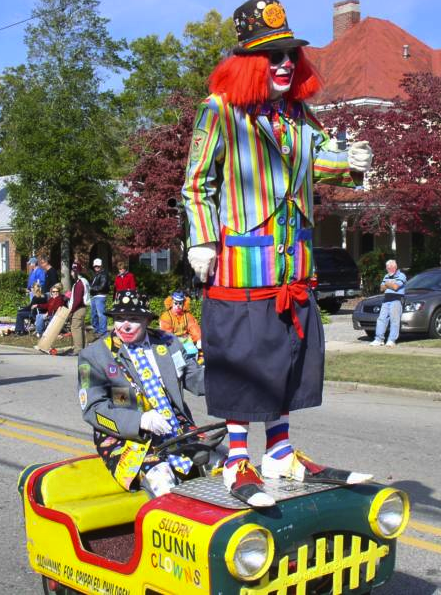 It was pulled through parades with a car battery operating an old phonograph player that skipped as much as it played, due to the less than smooth pavement. 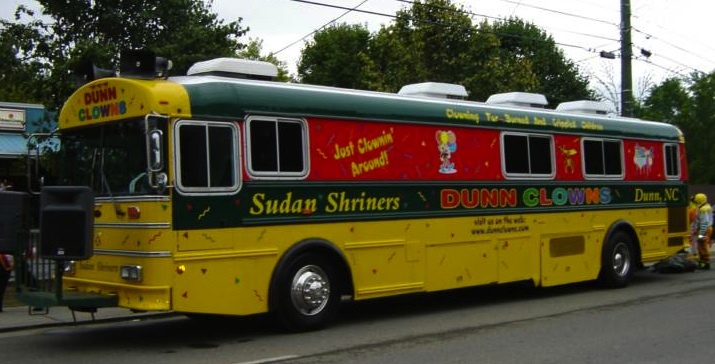 The first ride-on unit was an old school bus that as "Slim's" memory recalls was painted green. He says that did not last long because it was well worn out when they got it. He recites a story of them returning from an out of town parade one night on the old bus when the generator went out and they drove in using battery power til the lights went out and the engine died. They were within 3 blocks of making it back and walked to get something to tow it in. After the old school bus came a munitions carrier (see photo on archives page) that was converted to meet their needs. This was prior to 1964 as J.R. Vann states. Robert Strickland made arrangements to have it delivered to Dunn free of charge from a ship yard in either Florida or Louisiana as "Slim" remembers. Ponder that thought for a moment...something that carried bombs that caused damage and destruction during time of war was now transformed into something to deliver laughter and cheer. Later, we had a 29' motor home. In 1960 the group attended the Macy's Thanksgiving Day parade which is by invitation only. The group had a wild idea in January 1961 to be in the Presidential inauguration parade of President John F. Kennedy in Washington D.C. (without invitation) and almost got arrested. It was received in good humor though. In the early days, Curtis Ennis was the only non performing member because he was the coach of the group. 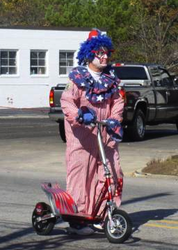 He would walk along the sidewalk with the clowns performing in the street and would critique their performance. 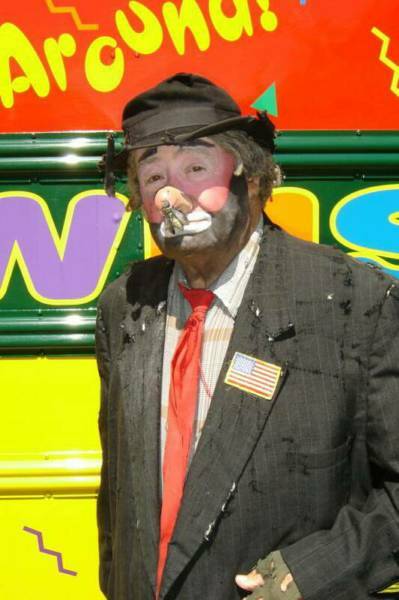 None of the clowns had any formal training and were learning through Ennis' "merciless criticism" to spot flaws in their routine, but the group valued his opinions about good showmanship. That basic formula for success still holds true today which is good clean, wholesome entertainment for the whole family. Around 1964 as JR. Vann (Robin) recalls, came the train engine that was yellow and red. Whitley Hood (Robin Hood) recalled his wife, Lois driving it through parades while attending the baby beside her on the floor. A more recent notable set of wheels was the caboose which was custom built on a 1976 Chevrolet chassis. 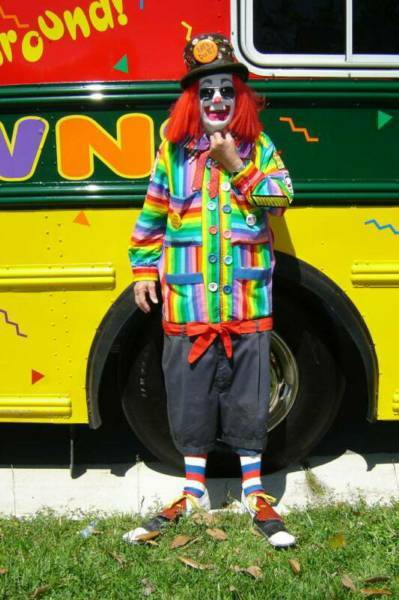 It was custom made by Willie's Camping Center of Clinton and served the unit well until being decommissioned and replaced by a train engine (converted school bus). This was the brainchild of Joe Wilson (Boss Pigg) and even had smoke eminating from the stack (or under the hood sometimes). But it got the job done! Today we have 40+ members and attend about 50 parades per year including some prestigious events such as the Governor's inaugural parade. At Christmas time, we have been known to perform in as many as six (6) parades in one day by dividing into separate groups. 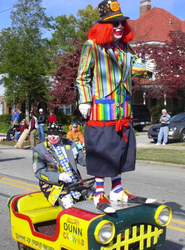 The Dunn Clowns are members of the South Atlantic Shrine Clown Association and some are members of the Southeastern Shrine Clown Association, and the International Shrine Clown Association. Over the years, the unit has had several members to be voted to the presidency of both organizations. Some, but certainly not all are listed below. Others will be noted when we can determine and document who they are. 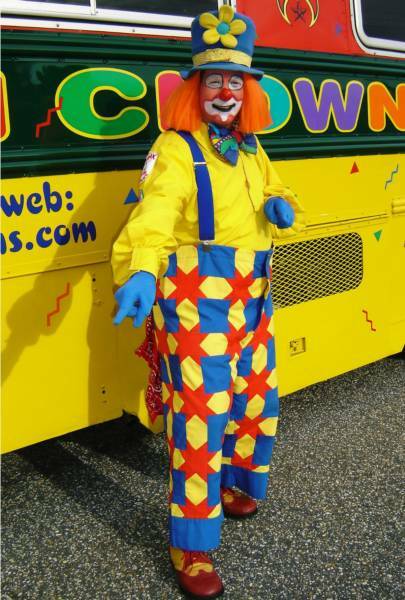 Currently, there are two clown trucks. 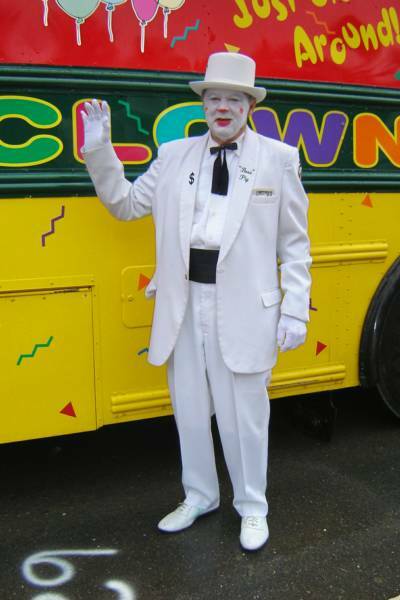 Our pride and joy is a converted Red Cross bloodmobile (thanks to the foresight of Bryon Pope) of which there is an animated story (click on Clown Bus Story above). We think you will find it amusing. In December of 2009, a retired bookmobile was purchased from Iredel county in Statesville, NC. It was transformed and placed into service in time for the 2010 Christmas parade season. They both have sound systems that would be the envy of any parade. This history is ever evolving and developing as information and news articles come forward. We will add and modify this story as it evolves and will make every attempt to be sure all information is factual and documented. Remember that clowns sometimes have BIG imaginations!